“Groups of youths out on holiday excursions often enjoy following the river though the mountains, eager to find its source. In ancient times, Chinese emperors would set off from the western regions on a thousand-kilometre journey to the eastern fringe in order to perform sacrificial rites dedicated to the great sea.” Even such seemingly ordinary events project a familiarity through the vastness of space and time. 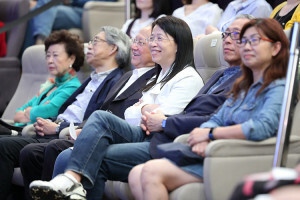 This shared cultural bond was the tone set by renowned Taiwanese prose writer Chang Show-foong right from the start of her lecture. 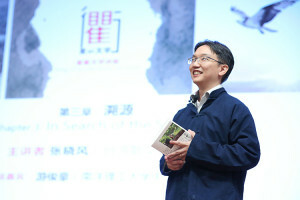 On 18 March 2017, Chang spoke at the Third Chapter of Chou Sing Chu Foundation’s Sing Chu Literature Lectures, using everyday events to illustrate the wonders of life in this boundless world. Movement. 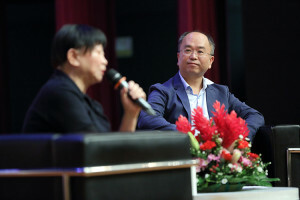 Chang represents the third generation, who took the rich literary learnedness and wrote about life and the society through wit and humour, to inspire the fourth generation (represented by the likes of Jian Zhen) and the fifth generation (represented by the likes of Chong Yee-voon). But Chang does not wish to be labelled. She once said, “I am just a woman who deeply loves the Chinese language.” Her passion was keenly felt by all during the lecture. As misunderstandings arise from not knowing the origin or allusion of words and phrases, Chang declared: “We do not have the right to freely interpret!” The same principle applies to all languages and cultures. Universities like Oxford and Cambridge were established to interpret the Bible, while in China, the thousand-year-old Yuelu Academy was founded in the Northern Song Dynasty to interpret the teachings of Confucius. Reading is not the only way to learn new knowledge. Many have learnt about traditional culture and ethics through interactions with others or by watching theatrical performances. Chang’s “shared story” approach, explaining how collective cultural memories take shape naturally in the grassroots, allows us to return to the original appearance and meaning of the classics and culture, enabling us to pass them on to the next generation. “I wouldn’t claim to have covered the entire modern Chinese history, but at least half of it has been brought out.” Chang followed this with interesting snippets from renowned Tang Dynasty poet Bai Juyi’s poem, Song Dynasty poet Su Shi’s ci, and Lu Xun’s short story Medicine to further illustrate the importance of the “shared story”. Perhaps, Chang hopes that this concept can help to sculpt the Chinese cultural community. 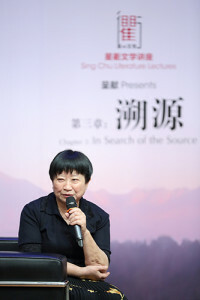 Chou Sing Chu Foundation launched the Sing Chu Literature Lectures in 2014 with the aim of regularly invite outstanding individuals from the Chinese literary community to share their journeys with fellow literature lovers. Celebrated Chinese prose writer Chang Show-foong delivered the third lecture in 2017. Born in Jinhua, Zhejiang Province in 1941, Chang graduated from Soochow University, and had taught in Soochow University, Hong Kong Baptist College (now Hong Kong Baptist University) and Yang-Ming University. Chang made her name with the distinctive style and elegant writing of her works. She has received countless awards, including the Sun Yat-sen Art and Literary Award, the National Award of Art, and the United Daily News Literature Award. She was also named as one of the “Ten Great Taiwanese Essayists” in 1977. The opinions expressed herein are solely those of the author(s). Reproduction of content will require full and clear credit to the author(s) and CSCF.